216-18 Hope Street, 200-202 New City Road, Glasgow. Mr John M Buchanan. 1893. John M Buchanan was a native of Dunfermline, when still an infant his parents removed to Carnoustie, in Forfarshire and there under the late Mr Gray (afterwards of Townhead, Glasgow,) a well-known and respected dominie of the old Scottish type, he received a thoroughly sound elementary education. On leaving school young John was apprenticed to the grocery trade with the largest concern in the district, the Co-operative Company's store, where he served for four years with credit to himself and to the satisfaction of the directors. Determined to seek a wider field, he came to Glasgow and engaged in the same line of business, the grocery and provision trade, with a firm in Bridgeton. 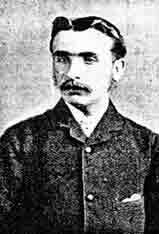 Ever anxious to better himself and gain experience, he was employed with John Ewing, grocer and wine merchant, Argyle Street, and so faithfully did he perform his duties that in a short time he was promoted to the responsible position of manager. After four years, Mr Buchanan purchased from Mr Miller the licensed premises, hope Street in 1880, and retained as his headquarters, and which he carried on under the style of Buchanan Brothers. Still ambitious and enterprising he acquired a pub at 200-202 New City Road, which by judicious alterations, he had improved beyond recognition. His manager Mr Alexander Robertson, who has held the reins of government since the opening of the concern by its present proprietor. Fond of art, and a generous patron of its votaries, Mr Buchanan's premises were decorated by unique, well-selected, and valuable, paintings, giving abundant evidence of his refined taste and appreciation. The Hope Street business was sold to wine and spirit merchant George Shields Peat in 1901, Mr Peat redecorated the premises and renamed the pub to Peat's Pavilion Bar.